Well-designed visuals can make your data more engaging. This webpage is full of tips and resources to help you make infographics that will wow your audience and impress your professors. Great design follows from good process. 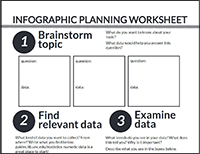 This worksheet will take you through important steps in planning your infographic. This video summarizes the basics of data visualization, including how to make sense of your data, what are the best types of charts/images to use with your data, and what kind of story do you want to tell with your information. This Lynda tutorial outlines how to make an infographic using Adobe Illustrator. An explanation of Illustrator’s tools and basic design principles are covered. Narratives aren’t just for books – your infographic should tell a story too! This video goes over various strategies on how to analyze your data to find meaningful relationships. While Adobe Illustrator is a great tool, this video introduces other programs that can be used for infographic design, as well as discussing design elements such as color and scale in more depth.